I studied law at Reading University and The College of Law, Chester. I was admitted as a solicitor on April Fool's Day 1985, which has always seemed somehow appropriate. For the next twenty-four years I worked almost exclusively in family law, dealing primarily with divorce, ancillary relief (financial/property settlements on divorce), private law children matters and cohabitee disputes. I was also a member of Resolution and of the Law Society's Family Law Panel. I started writing Family Lore in January 2006, which I believe makes it the first family law blog in this country. I gave up practising in 2009 and now work freelance as a writer on family law matters. In August 2009 my book Do Your Own Divorce, a guide for litigants in person, was published. I also run the website Family Lore Focus, which includes Family Lore News, and the Family Lore Case Digest. 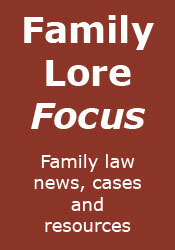 Family Lore Focus publishes a free weekly email Newsletter containing links to the most interesting family law news stories, cases, articles and blog posts of that week. You can email me at: john[at]familylore.co.uk. Please note, however, that I will not be able to give advice via this email address. I am also unable to advise in comments. If you want advice, you can find a specialist family lawyer here. If you would like to advertise on Family Lore, Family Lore Focus, or in the Newsletter, see my advertising policy.